Alana is a lecturer in the Graduate School of Health, Discipline of Physiotherapy. Her research in the Clinical Neurostimulation Laboratory uses noninvasive brain stimulation techniques in humans to better understand neurological movement disorders such as stroke and dystonia. 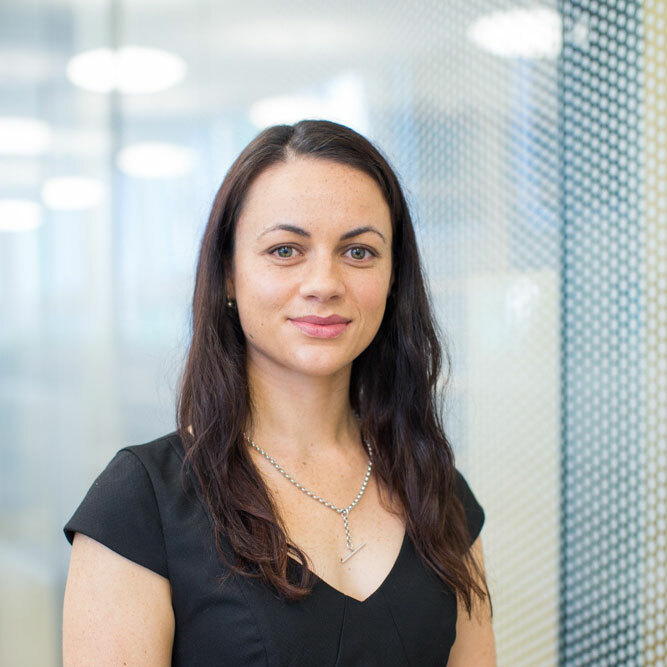 Previously, Alana completed her PhD in the Movement Neuroscience Lab at the University of Auckland Sport & Exercise Science department and moved to UTS as a postdoctoral research fellow. Alana is a subject-coordinator for Research Projects 1 & 2 in the Masters of Physiotherapy course where she guides the students in the design, ethics, data collection, analysis, and dissemination of a group research project. Acupuncture is gaining interest as a potential treatment modality for various neurological conditions. Yet, the underlying mechanisms and efficacy on brain function are not well understood. Therefore, this study investigated the previously proposed hypothesis that acupuncture suppresses motor cortex excitability using transcranial magnetic stimulation (TMS) in healthy adults. The study was randomised, sham-controlled, and double-blinded. Single and paired-pulse TMS was delivered before, during, immediately after, and 30min after removal of the needle. Acupuncture to the right Hegu acupoint (LI-4) of the hand was delivered by an experienced acupuncturist using standardised manipulations. A disposable (0.22×30mm, Hwato) needle was used for verum stimulation (penetrating) and a Park retractable needle for sham (nonpenetrating). The peak-to-peak amplitude of TMS-induced motor-evoked potentials was recorded from two intrinsic hand muscles. Needling sensations were quantified using the Massachusett's acupuncture sensation scale. Participant needling sensations were not different between verum or sham acupuncture (P>0.54). Corticomotor excitability, intracortical inhibition, and intracortical facilitation were not modulated by verum or sham acupuncture during, immediately after, or 30min after, recorded from a local or distant hand muscle to the needling site (all P>0.075). Contrary to previous studies, manual acupuncture did not affect motor cortex excitability in healthy adults. Because of the increasing popularity of acupuncture therapy, further research using patient populations should be considered. Chronic stroke patients with moderate-severe motor impairment may have an increased reliance on contralesional vs ipsilesional motor areas to control the paretic arm. We hypothesised that increasing contralesional excitability with anodal transcranial direct current stimulation (a-tDCS) would benefit motor performance in patients with moderate-severe impairment.Ten patients with motor impairment at the chronic stage after stroke received a-tDCS, cathodal (c-tDCS) and sham with the target electrode over contralesional motor cortex (M1). Motor performance was quantified from the circularity and size of planar movements made with the paretic arm. Contralateral and ipsilateral corticospinal excitability was inferred using transcranial magnetic stimulation. Corticospinal tract integrity and basal GABA concentration were assessed with magnetic resonance imaging and spectroscopy.Anodal tDCS increased contralesional corticomotor excitability evident from motor evoked potentials in both wrist extensors (both P<0.043). Cathodal tDCS did not affect corticomotor excitability (P>0.37). The effect of tDCS on motor performance with the paretic limb was negatively associated with ipsilesional GABA concentration after c-tDCS (P=0.001).Further investigation of noninvasive brain stimulation protocols that facilitate contralesional M1 is warranted.The inter-hemispheric imbalance model of stroke recovery may not apply to patients with more severe impairment. Cervical propriospinal premotoneurons (PN) relay descending motor commands and integrate peripheral afferent feedback. Effects of anodal transcranial direct current stimulation (a-tDCS) on propriospinal excitability in the upper limbs are unknown.Healthy right-handed adults received a-tDCS or sham tDCS over primary motor cortex (M1) at 1mA (Experiment 1, n=18) or 2mA current intensity (Experiment 2, n=15). Propriospinal excitability was assessed by suppression of background electromyography (EMG) in extensor carpi radialis (ECR) from electrical stimulation of the superficial radial nerve during bilateral (Experiment 1 and 2) or unilateral (Experiment 2 only) activation of the left and/or right ECR. EMG suppression could be attributed to an early propriospinal component and late cortical component. Motor evoked potentials (MEP) were obtained as a manipulation check.Before tDCS, propriospinal-mediated cutaneous-induced suppression was present in each arm for early and late components. ECR MEP amplitude increased after 1mA, but not 2mA, a-tDCS. Neither 1mA nor 2mA a-tDCS modulated either component of ipsilateral or contralateral propriospinal excitability during bilateral or unilateral tasks.Propriospinal-mediated cutaneous-induced suppression was not modulated by a-tDCS in healthy adults.Reporting non-significant findings is paramount for the development of clinically-relevant tDCS protocols. To test the feasibility and acceptability of an implementation intention strategy (if-then plans) increasingly used in health psychology to bridge the goal intention-action gap in rehabilitation with people with neurological conditions who are experiencing difficulties with mobility.Twenty people with multiple sclerosis (MS) and stroke, randomised to an experimental and control group, set up to three mobility related goals with a physiotherapist. The experimental group also formulated if-then plans for every goal.Focus groups and interviews with participants and therapists; Patient Activation Measure (PAM), 10-m walk test, Rivermead Mobility Index, self-efficacy, subjective health status, quality of life.Qualitative data highlighted one main theme: Rehabilitation in context, encapsulating the usefulness of the if-then strategy in thinking about the patient in the context of complexity, the usefulness of home-based rehabilitation, and the perceived need for a few more sessions. Changes in walking speed were in the expected direction for both groups; PAM scores improved over 3 months in both groups.If-then plans were feasible and acceptable in bridging the goal intention-action gap in rehabilitation with people with MS and stroke, who are experiencing difficulties with mobility. This approach can now be adapted and trialled further in a definitive study.Goal planning in rehabilitation necessitates specific strategies that help people engage in goal-related tasks. If-then plans aim to support people to deal more effectively with self-regulatory problems that might undermine goal striving and have been found to be effective in health promotion and health behaviour change. This feasibility study with people with a stroke and multiple sclerosis has demonstrated that if-then plans are feasible and acceptable to patients and physiotherapists in supporting goal-directed behaviour. Propriospinal premotoneurons (PN) are essential for accurate control of the upper limb. They receive bilateral input from premotor (PM) and primary motor (M1) cortices. In humans, excitability of PNs can be estimated from motor-evoked potentials (MEPs) by pairing a descending volley using transcranial magnetic stimulation (TMS) to summate with an ascending volley from peripheral nerve stimulation at the C3-C4 level of the spinal cord. Transcranial direct current stimulation (tDCS) alters excitability of cortical and subcortical areas. A recent study demonstrated that cathodal tDCS can suppress facilitatory (FAC) and inhibitory (INH) components of PN excitability, presumably via effects on corticoreticulospinal neurons (Bradnam LV, Stinear CM, Lewis GN, Byblow WD. J Neurophysiol 103: 2382-2389, 2010). The present study investigated the effects of bilateral tDCS with healthy subjects. The cathode was placed over left dorsal PM or M1 and the anode over right M1 in separate sessions (PM-M1, M1-M1, or Sham). TMS of right M1 elicited MEPs in left biceps brachii across a range of TMS intensities chosen to examine PN-mediated FAC and INH. Conditioning was applied using median nerve stimulation with an interstimulus interval that coincided with TMS and peripheral volleys summating at the C3-C4 level. All participants showed FAC at TMS intensities near active motor threshold and INH at slightly higher intensities. After tDCS, FAC was reduced for M1-M1 compared with Sham but not after PM-M1 stimulation. Contrary to an earlier study with cathodal tDCS, INH was unchanged across all sessions. The difference between these and earlier findings may relate to dual- vs. single-hemisphere M1 stimulation. M1-M1 tDCS may be a useful adjuvant to techniques that aim to reduce upper limb impairment after stroke. way to promote physical activity within Pacific communities. among Pacific adults over four weeks. Methods: Twenty untrained (13 female) Pacific adults were randomised to intervention or control. differences between groups, adjusting for baseline values, age and gender. were no other significant differences. fitness and reducing the risk of diabetes and cardiovascular disease in Pacific adults. Cervical dystonia (CD) is characterized by painful, involuntary twisting of the neck, and sometimes tremor. Unfortunately, treatment options for CD are limited and the underlying pathophysiology is not well understood. Recent evidence implicates cerebellar dysfunction may play a role in the development of CD symptoms. Non-invasive brain stimulation is able to modulate neural excitability of the cerebellum. The present study examined the effect of five consecutive days of anodal transcranial direct current stimulation (tDCS) over the cerebellum of adults with CD (2mA, 20min). Patients received five sessions of anodal tDCS and sham tDCS in a randomised, cross-over design that was double-blinded. During tDCS, patients performed a motor imagery task (first 10min) and a real movement task (last 10min). We hypothesised that anodal tDCS would improve patient's clinical features and modulate neural excitability of the cerebellum. Clinical features were examined using the TWSTRS2, CDQ-24, cervical range of motion, and visual analogue scales of pain. Behavioural outcomes were assessed using a motor learning finger tracking task. Neural excitability was inferred using eye-blink conditioning to examine cerebellar excitability and single-pulse transcranial magnetic stimulation (TMS) over the motor cortex to examine corticomotor excitability and intracortical inhibition. Motor evoked potentials (MEP) and cortical silent periods (cSP) were recorded bilaterally from the upper trapezius (UT) and first dorsal interosseous (FDI) muscles. All dependent measures were assessed on day-1 and day-5 of the intervention, and follow up questionnaires were completed one and four weeks later. There was a minimum washout period of 5weeks between treatment blocks, and patients undergoing Botox were tested 4weeks post injections. The study is in the late stages of data collection and analysis (n=14 patients enrolled, 8 males). Acupuncture is a therapeutic technique that is being used as an adjuvant to treatment in a variety of health-related disorders. However despite its increasing use in western countries, the underlying mechanisms are not fully understood. The aim of this study is to investigate the underlying neurophysiological mechanisms of acupuncture by examining the effect of real (verum) and sham acupuncture to the hand on the excitability of the motor cortex (M1) in healthy adults. A better understanding of the underlying mechanisms of acupuncture may improve the potential therapeutic application of acupuncture for neurological disorders in the future. Healthy, right-handed, adults with no neurological or musckuloskeletal conditions participated in the study. Participants were randomised to receive verum or sham acupuncture to the Hegu acupoint of the hand on separate days, with a minimum 5day washout. The intervention type was double-blinded, and the acupuncturist was not involved in data collection or analysis. Transcranial magnetic stimulation (TMS) was delivered to the left M1 and surface electromyography was used to record TMS-induced responses from the First Dorsal Interossues (FDI) and Adductor Digiti Minimi (ADM). Stimulus-response curves, short-intracortical inbhition (SICI-2ms) and intracortical facilitaiton (ICF-15ms) were measured before, during, immediately after needle removal, and 30min after needle removal. Needling sensation questionnaires were administered after each session, and self-rated anxiety was assessed before, during and after needle removal. Relative to sham, verum acupuncture did not modulate corticomotor or intracortical excitability in either muscle across time (all P>0.05). There were no differences in the severity of needling sensations between sessions (all P>0.05), therefore sham park needle acupuncture was likely an adequate sham control. McCambridge, AB, Stinear, JW & Byblow, WB 2014, 'P647: A dissociation between propriospinal facilitation and inhibition after bilateral transcranial direct current stimulation', Journal of Clinical Neurophysiology, ICCN, Lippincott, Williams & Wilkins, Berlin, pp. S226-S226. McCambridge, AB, 'Ipsilateral Motor Evoked Potentials and Intracortical Inhibition'. Seeking to better understand the role of ipsilateral primary motor cortex during functional motor tasks, Byblow and colleagues examined whether ipsilateral motor evoked potentials (iMEPs) in the biceps brachii would be suppressed by sub-threshold conditioning, thereby demonstrating short-interval intracortical inhibition of iMEPs. In this podcast, Editor-in-Chief Bill Yates (University of Pittsburgh) and Associate Editor Monica A. Perez (University of Miami) join authors Winston Byblow (University of Auckland) and Alana McCambridge (University of Auckland) in an engaging discussion about their recent work. Are ipsilateral motor evoked potentials subject to intracortical inhibition? Listen and find out.